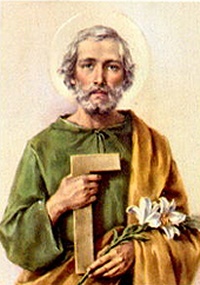 Today is the Solemnity of St. Joseph, the foster father of the Christ. He is sometimes called the Silent Saint because there is no scriptural quotes attributed to him, despite all the deeds attributed to him. A man of action, it seems. I remember Pepere as himself being a quiet man, though possessing a dry and sparkling sense of humor. Of course, I was just a kid and he may well not have been so quiet in the totality of his life. I am known for a dry sense of humor. If it is genetic, however, I don’t seem to have inherited the quiet part. I might be a little talkative once you get to know me. So, the silence of the Silent Saint comes with some irony related to my confirmation, but Joseph is also the patron saint of fatherhood. Fatherhood saved me. It didn’t save me from drugs, alcohol, gambling or whatever. It saved me from being totally absorbed by self. The point to which discernment should always bring us is willing the good of the other. I married my wife when I realized I could never intentionally hurt her (unintentionally is, of course, another story). When my daughters were born, the innate drive, that law written upon my heart, willing the good of the other, strengthened and rewarded me. I did little if anything to glorify fatherhood, but fatherhood elevated me. The Holy Mother is known for her great “yes” when she responded to Gabriel and the will of God. So did Joseph when he silently rose from his numinous dreams and walked the walk rather than talking the talk. St. Joseph, pray for me, that I might be a better man. Any work of successful fiction develops a sort of hagiography concerning its creation. In the mind’s eye we see Tolkien walking through open woodland envisioning a procession of elegant elves as though he were watching a movie. We are given simplistic examples of what has “influenced” the author. But anyone who has produced a work of creative writing (or any other kind of creative work for that matter) can tell you that reality is messier, an organic process from which the author brings (hopefully) forth a coherent and condensed truth. 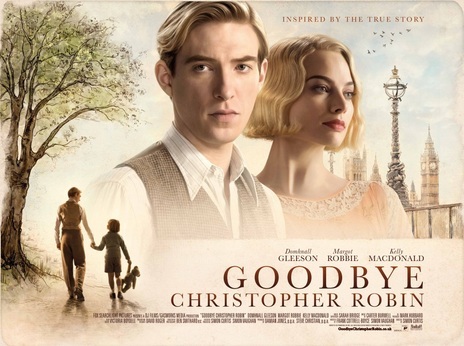 The film, Goodbye Christopher Robin, offers a glimpse into that reality. And yes it is messy. And complicated. The author, A. A. Milne was a man wounded on so many levels by his experiences in WWI. What became the stories about Winnie the Pooh were the floundering of a drowning man grasping at the love for his son. The purity of Christopher Robin’s sense of wonder gives the author a place where his mind can rest in a nostalgic memory of when his own life was a sweeter thing. The movie is also the story of “Billy”, Christopher Robin’s nickname. The struggle to gain his parent’s attention while buoyed by support of his nanny. The pain of becoming a commodity rather than a child. The mother, Daphne, is the most enigmatic character in the movie. Witty, clever and yet seeming so wrapped up in herself. There are some brief instances where we see what motivates, or has damaged her—like the scene where she protests the prospect of war because it leaves her alone, not knowing what has happened to the ones she loves. She is drawn like a sketch, owing perhaps to the fact that she spent the last fifteen years of her life estranged from her son. A.A. Milne is reconciled to his son, with a sweet but realistic sense of self-awareness. Love wins. It was there all that time. The lifeline of the wounded and the lost. She’s right, but I think we can look at him more fully understood thanks to this film. I do not think the “messy” will diminish, but rather, enrich what we see. Haunted by Resonance: A review of General Escobar’s War. In light of what happened in Charlotteville, VA and is happening now in various spots around the country, I feel compelled to reblog this review. As I write this, it is the eve of the 2016 election. And I am haunted. Imagine a time when a nation is being pulled apart by hostile agendas, uncompromising political forces demonize one another and there seems to be no clear choice for people who value the rule of law, their faith, and honor. Imagine a time when secular “isms” demand a dogmatic, unquestioning loyalty that matches and even exceeds religious zealotry. Imagine a time when households are divided by political fury. It sounds alarmingly recent, but it is the stage for General Escobar’s War a novel by Jose Luis Olaizola, written not in 2016 but in 1983 concerning events of the Spanish Civil War occurring in 1936-39. A historical novel based on the papers of Antonio Escobar Huerta. A true story. Finally. He seems a gentle and pastoral leader. An auxiliary bishop of Atlanta, Luis Zarama becomes the first Latino to lead a diocese in the Southeast outside of Florida. Maybe it was a Bogfoke. . . I am not sure how to review a film that is seven minutes long, except to say it is probably well worth every minute. I know him! I know him! A week with a friend. Preparing to leave for Ash Wednesday Mass, I cannot help but think of Audrey Prescott who moved to the D.C. area to be near family. She is missed. 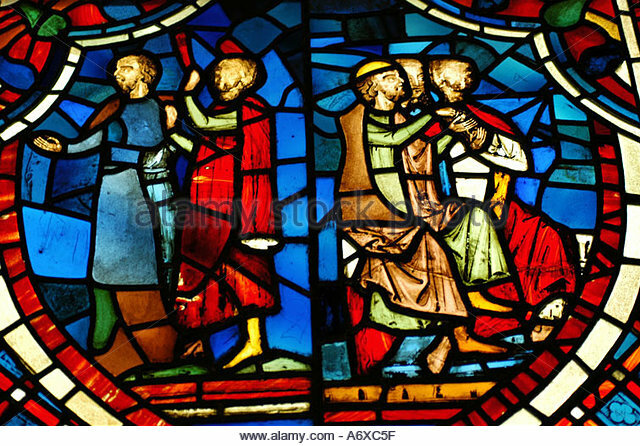 Linked is a blog I wrote about Ash Wednesday and the Three Massketeers last year. Michael Novak, philosopher, journalist, novelist, and diplomat died this past February 17th. For some reason I only ever read one of his books, No One Sees God: The Dark Night of Atheists and Believers, but it was certainly instrumental in deepening my reawakened faith. I consider No One Sees God to be a work of genius. There is nothing new or groundbreaking in the book, but the crafting of it was superb. Novak presented such a coherent intellectual vision of a thinking man’s faith that I found myself thinking “yes, that’s it” over and again. Part apologia and part dialog, the book helped me give structure to my own thoughts. I have read it from cover to cover more than once, and have read sections of it even more often than that. I’m not sure why I never got around to reading another of his works. I’m fairly certain I would not connect so intimately to all his work as I did with No One Sees God, but surely I would have found fresh ground for pondering. The wiki entry on Michael Novak gives an idea of just how full was his life. Reading this novel created an all too unnerving echo of what we can see happening around us today. The situation today may not be as complicated or dire, just yet, as the events of 1936-39, but the resonance is there. It is not at this time as harsh, but it is distressing to see the growing tension not just between political agendas, but the schism from that tension infecting families. There is a weight of fatalistic sorrow in General Escobar’s War that would soon become oppressive were it not for the title character’s steadfast nature. Antonio Escobar Huerta is no cardboard hero. He worries. He frets. He experiences dread, fear, hope, anger and uncertainty. But, through it all he holds fast to faith and honor. In short he is a man who senses a reality beyond the immediate. The good General Escobar realizes that surrendering what is moral and honorable is to lose anything that truly matters. Such a realization is beyond inconvenient. As readers it might be disquieting for us to contemplate. For General Escobar it was a doom. So read this book. Ponder if you would ever dare bring down such a doom upon yourself for the sake of those virtues that are the mortar of our “sure and certain hope.” I believe that you too will be grateful that there have been men and women like Antonio Escobar Huerta scattered throughout our history..
You might also find yourself praying that they are among us still.